Chabad of Holmdel and Colts Neck is proud to announce its first ever "Shabbat of Unity" for residents of Colts Neck, Holmdel, and Middletown. As the Jewish New year is about to begin, and people desire to have a greater appreciation of the High Holiday period and its significance, Chabad House offers a complete Shabbaton experience with traditional delicious Shabbat foods and a featured speaker. 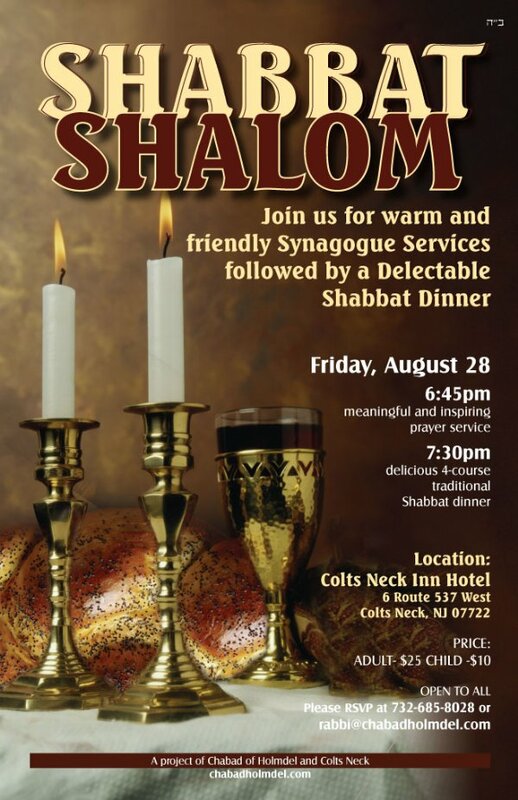 This weekend event will take place on Friday, August 28th at 6:45 PM in the Colts Neck Inn, 6 Route 537 west, Colts Neck, N.J. 07720. Following Shabbat Services (with much song and communal readings), a complete four course Shabbat meal including wine, home made Challot, Gefilte Fish, Chicken soup with Matzah Balls, Roast Chicken and delectable Kugels will be served. Rabbi Ephi Carlebach, director of Chabad of Holmdel-Colts Neck stated, "As we prepare for Rosh Hashana and Yom Kippur, I am confident that many participants will be inspired by this unique and special Shabbaton. We will discuss the meaning of many New Year customs and prayers, how to make the New Year truly relevant in this day and age, share ideas of how we as a people make the proper resolutions, and begin our New Year in the best manner spiritually and physically". The entire community is invited and the nominal cost for the Shabbat Meal is $25.00 per person and $10.00 per child. For further information on the Shabbaton, and for any info regarding the upcoming Jewish New Year and for schedule of services, please call Rabbi Ephi Carlebach.